Porch lifts are sometimes referred to as vertical platform lifts or deck lifts and are usually used in applications where a wheelchair ramp is either impractical or unwanted. They are fairly simple devices which consist of a platform which travels up and down a tower to move the user from one level to another. While normally used outdoors to make an existing residential unit wheelchair accessible, porch lifts are also used occasionally indoors and in public buildings. We don't have anything to do with the US company who markets a lift known as a "Porch Lift". Here in Canada the term "porch lift" is pretty generic and applies to any make or model of vertical platform lift used for a porch or deck. The links in the menu on the left of each page will take you to pages which discuss various topics related to porch lifts. Portable porch lifts are most often used in pubic applications where there is only occasional need for a porch lift. Standard porch lifts are used in residential applications and are permanently installed. Commercial porch lifts are basically the same as standard but have added safety features to satisfy the rigorous safety regulations which apply to public buildings. Our Lift Features page describes the basic components of porch lifts and offers some basic information on each feature. Our Lift Options page offers information on options which may be required for the user's individual application. Our Lift Accessories page has information on accessories which while not usually required may be useful to some users. 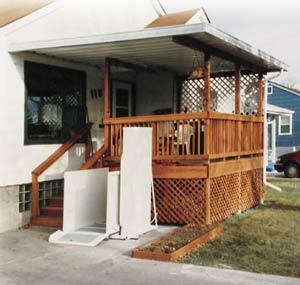 Porchlift Fact Sheet - This link will take you to a page which we have devoted to basic porch lift information.